A blog about herbal and natural healing with recipes, information and inspiration to incorporate herbs into everyday life. This blue “starflower” is one of my favorite flowers, and I just love being greeted by its sweet and captivating presence in the garden. Every garden should have this plant, but keep in mind it can easily take over if it isn’t thinned and weeded out as needed. The vibrational energy and vitamin/mineral content of borage nourishes the garden, gardener and home. The greens and flowers are edible, and the plant is a dynamic accumulator, meaning it pulls specific nutrients from deep in the soil up into its tissues. The weeded greens and cut plant can be mixed into the compost or incorporated directly into the soil to break down, nourishing the top layer of sou. Borage is rich in vitamins and minerals that help rebuild the body, support the adrenals, and calm agitated nerves, anger, and frustration. Borage helps to bring courage to the heart. It is a wonderful ally to support the person suffering from nervous exhaustion who has been burning the candle at both ends and is depleted with low spirits. 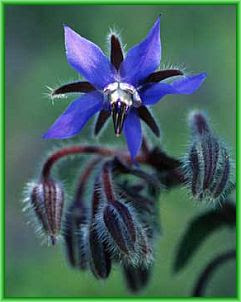 Borage (Borago officinalis) is in the Boraginaceae family, which also includes comfrey, alkanet and forget-me-nots. It has fuzzy leaves with adorable vibrant blue flowers with 5 points, resembling a star. 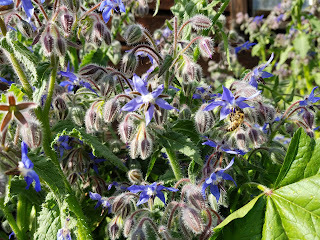 Bees absolutely adore this plant, and as borage is known to help increase honey production, it is a favorite among bee keepers as well. Graze on the flowers weekly and even daily during peek flowering times to stimulate growth. More flowers will continue blooming as the plant grows taller and wider. Leave at least half the flowers for the bees and other critters to enjoy. 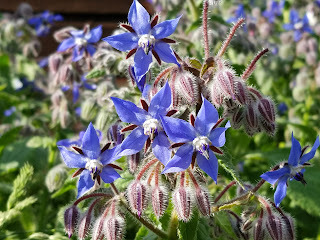 Borage is a prolific self-seeding annual and once it is established in the garden, it will be there to stay. When the plant has been fully harvested and dies, cut it back and add the material to your compost or break it up and mix it into your soil to nourish and aerate it. As new plants sprout, thin out the unwanted plants and use the greens in your meals. In mild climates, borage can flower as much as three quarters of the year. The young leaves and flowers are edible. The leaves are high in vitamins A, C, niacin, riboflavin, potassium, calcium and other trace vitamin and minerals. Sauté the fresh young greens in stir fries and along with other veggies when making sauces, curries and soups. You can peel the rough hairs off the stems and eat them like you would eat celery. Try the fresh flowers raw in salads and baked goods. The blue flowers make lovely decoration on frosted cakes, in jello, pudding, herbal ice cubes, etc. Keep the fresh flowers refrigerated until they're served as they will wilt. I also love to make a nourishing tea with the fresh leaves and flowers, and often combine borage with other fresh herbs from the garden. Borage and mint are a lovely combination, especially on hot summer days. I also really adore an infusion of borage and calendula with perhaps a little passion flower or valerian flower for soothing the nerves and lifting the spirits. Borage, vervain and milky oats make a wonderful combination for restoring balance to over-achiever types experiencing burn-out. Many traditional references claim borage is best prepared using a cold liquid instead of hot. Try it as a cold infusion or sun tea by allowing the tea to infuse in cold water for 2-8 hours in the sun or moon light or adding the borage to chilled wine to infuse. Borage makes a great companion plant for tomatoes, strawberries, legumes and spinach. It is very resilient against insects and pests, discouraging and repelling many harmful insects while attracting and feeding beneficial bees which every garden needs. Many of the properties of borage are lost when dried, so it is best to grow it and work with it fresh throughout the season. To preserve the plant for use the rest of the year, make an infused wine or vinegar to take daily as a tonic. You can also infuse the fresh flowers and leaves in alcohol to make a tincture, or add the flowers to witch hazel extract along with other healing herbs such as calendula, roses and lavender for a lovely skin tonic and first aid remedy. 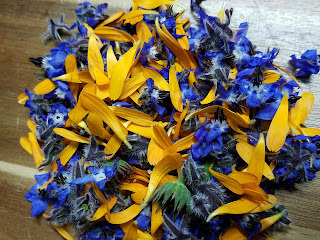 The flower essence is one of my favorite and most utilized borage preparations, so I will include the instructions for making your own below. Borage is a soothing remedy for stress, anxiety and adrenal burnout that is especially helpful when the spirits need lifting, or when there is a loss of courage and the mind, body and spirit need a cooling and soothing energy to nourish them. 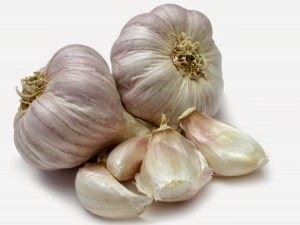 It supports and strengthens the adrenals and nervous system. It is one of the few adrenal tonics with a calming energy; a majority tend to be more stimulating in nature. Its cooling energy is great for those with nervous tension who run hot and for those who are easily angered and agitated. Borage helps with regulating the hormones and is a lovely women’s reproductive tonic that nourishes the reproductive organs and relieves moon-time and menopausal discomfort and symptoms. It is perfect for women going through menopause who need to cool their hot flashes and rebuild their adrenals over-worked from an over-stressed life. It is wonderful post-partum for new mothers, as it increases lactation while smoothing out the hormone fluctuations, adrenal fatigue, sleep-deprivation, nervousness, and post-partum depression common after giving birth. The nourishing properties and rich vitamin and mineral content make it a good tonic to encourage healing while recovering after injuries. Borage can also be used to help peak fevers, especially fevers with signs of excess heat rather than chills. The flowers make a wonderful demulcent syrup, good for dry respiratory ailments including coughs, colds, wheezing, shortness of breath and asthma. Borage can also be used for topical first aid. It cools inflamed skin and can be used as a poultice, wash or other applications for skin irritations such as rashes, hives, chicken pox, measles, eczema, psoriasis, or acne. 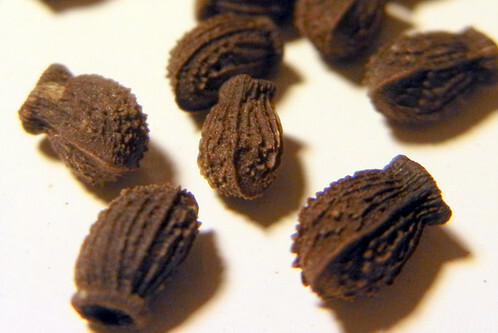 It can benefit the healing of skin ulcers, wounds, or abscesses. Prepare an eye wash for sore and inflamed eyes. Most borage grown commercially is cultivated for its fruits, which are crushed and cold pressed into a nourishing oil rich in Omega 6 fatty acid. This oil is beneficial for general inflammation, like arthritis, as well as the inflammation of sensitive skin, such as eczema, psoriasis, rashes and acne. 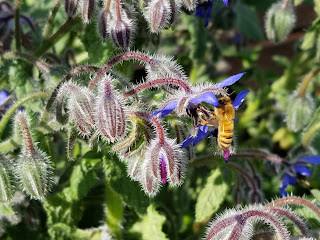 Borage leaves contain trace amounts of pyrrolizidine alkaloids (PAs), some forms of which are known to cause harm to the liver in excess amounts. That said, eating a small amount in your food or drinking a little tea daily or weekly while the plant is in season is not known by the author to pose any risk for healthy individuals. If you have a compromised liver or overt liver disease, avoid consuming the plant in large quantities or for extended periods of time. 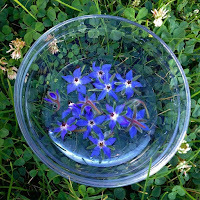 In this case, connecting to the vibrational healing of borage, perhaps by using a flower essence, can still be beneficial and avoids any potential harm from the PA’s. Since the first time I laid eyes on this plant, I have been intensely drawn to it, and am often not able to take my eyes off it or resist spending time with it when I see it growing. Borage is one of my plant allies and it will always be in my heart. 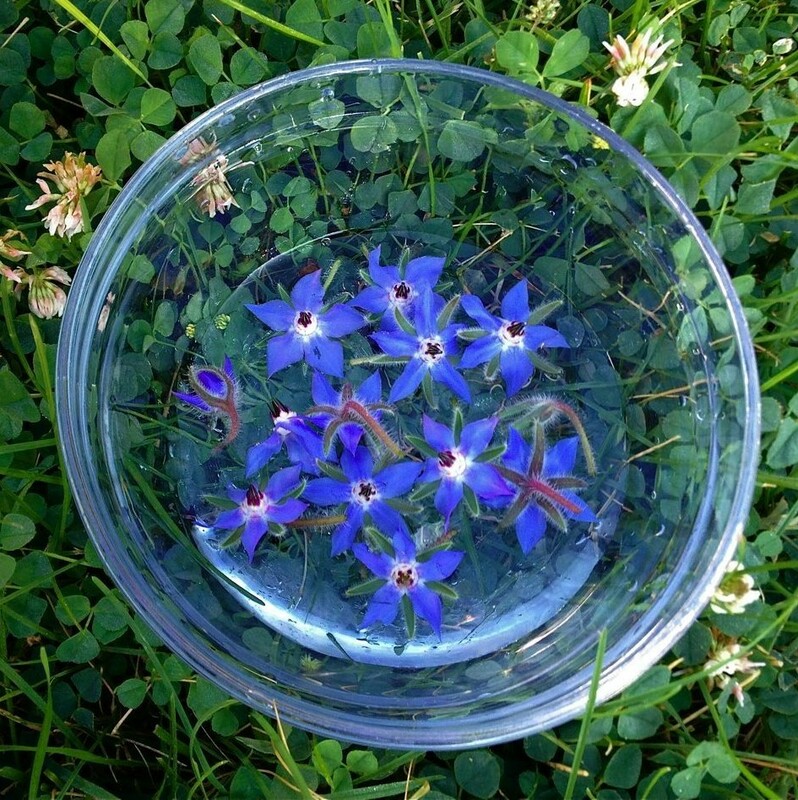 My first intentional plant meditation with a live plant was borage, during a time when I needed courage and hope to make significant and difficult changes in my life and relationships. I truly needed a community but had no courage or energy to reach out and build one, as I was suffering from adrenal burnout, malnourishment and inflammation. After sitting with its strong yet gentle presence, I found a heavy weight lifting off my shoulders and heart. The nervousness I would get when thinking about life changes dissipated and was replenished with a comforting and reassuring feeling, filling me up with courage, optimism and excitement for another fork in the road and a change in my journey. The timing of my journey to become an herbalist and live my life around and through plant medicine coincided with my meeting this wonderful and reliable plant friend. Borage holds a deeply special place in my heart. Since then, the lessons I have learned from this plant are endless, and when exhaustion takes over due to my ambitious, over-achieving nature, I am always gently reminded of the nourishing comfort of borage. I look forward to receiving more nourishment and healing reminders while continuing to explore the depth of this plant. A cup of courage in the tea! Flower essences are made by soaking flowers in water under the sun and preserving their vibrational healing imprint in that water with brandy. These remedies heal and bring balance to the energy within the body, soothing the emotions and spirit. When our energy is free flowing and in balance, our body can heal physically and emotionally; therefore, flower essences are a way to integrate the healing of our mind, body & spirit. For best results, harvest flowers early in the morning from well-established, happy, vibrant plants with an abundance of blooming flowers. First, connect to the plant by taking a moment to meditate with it. Clear your thoughts and sit next to the plant. Pick 1-2 flowers and eat them slowly, allowing the flowers to melt and dissolve in the mouth. Notice the taste, texture and feeling you experience while eating the plant. Then, take a good look at the plant. Notice the details and characteristics of how the plant grows. The fine hairs, the shape of the leaves, the contrast in colors, the dew gathered on the plant, and whatever else catches your attention. Take some slow and deep breaths, closing your eyes if you like. Place your hands on the ground next to the plant to connect to its roots and the earth it is growing from. Clear your thoughts and listen for any messages from the plants. What thoughts and feelings are coming to you? Are you experiencing any memories or visualizations? Allow yourself to relax and trust the information as it comes. Ask the plant for its permission to harvest and use it as medicine, stating your intentions for the medicine. After your meditation, give thanks and honor to the plant for any information you receive. You may choose to offer the plant some herbs, a rock, crystal or a piece of your hair as an offering. Then very carefully and mindfully pick the flowers, trying not to break their petals. Place the flowers in a bowl filled with spring or filtered water so the flowers are floating on top and spread out evenly, completely filling the space or diameter of the bowl. Place the bowl in a safe place under the sun for 4-6 hours. After the peak of the afternoon, the flowers will likely be wilted. 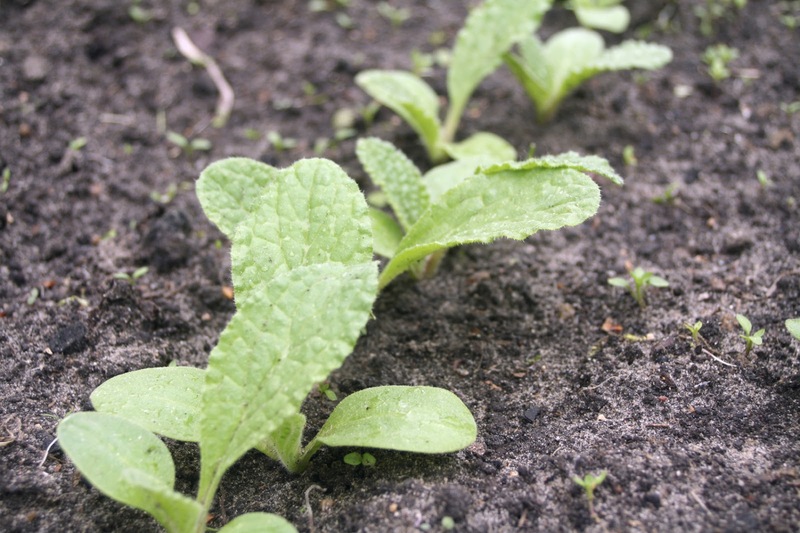 Carefully remove them, ideally using a clean borage leaf to scoop them out. Strain any remaining particulates if needed, measure the volume of water and add an equal quantity of brandy to preserve the preparation. Bottle and take 1-3 drops under the tongue or topically on the skin for vibrational healing, cooling any emotional or physical heat, inflammation, irritation, anger or depletion and replacing it with lifted spirits, confidence and courage. May the courage of borage be carried in your heart! 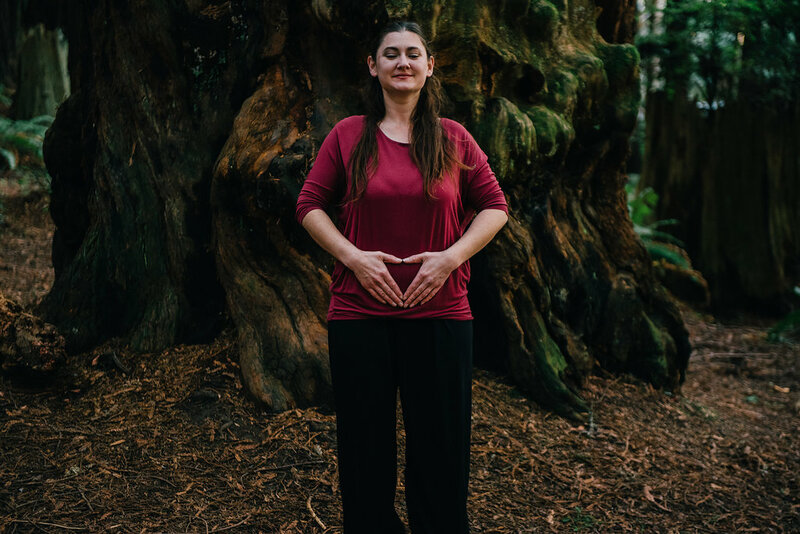 Candice Brunlinger has an integrative approach to healing, using plant spirit medicine, herbal medicine, fermented foods/drinks and energy healing tools such as Tai Chi, Qigong, EFT and Eden Energy Medicine for healing. Her classes focus on ways of integrating these healing modalities in to our daily lives and routine in a practical and convenient way so being healthy is “a way of living”. 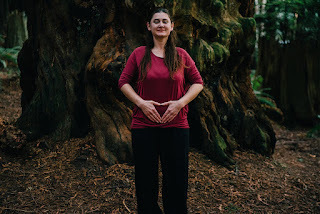 She teaches for the Northwest School of Botanical Studies & Humboldt Herbals, has a small clinical practice and an herbal product line, Herbal Infusions. She also teaches tai chi, qigong and other energy healing exercises. You can visit her Herbal Living and Healing or Humboldt Tai Chi websites, Nourishing Herbs blog, or become a member of her facebook group Herbal Living. You can also like and follow her facebook pages Herbal Living and Fermenting and Humboldt Tai Chi. Warm Up Your Life With Delicious Fire Cider!! Copyright 2016. Watermark theme. Powered by Blogger.